The Ivy League basketball season, except for teams playing in a few secondary tournaments, came to an official end in the NCAA Big Dance in Jacksonville, Fla., where Yale barely failed in a massive comeback attempt. The Ivy Leaguers fell to third seed Louisiana State Univ., 79-74. LSU (27-6) jumped off on an opening 9-0 run, was ahead 45-29 at the break and by 18 in the second half. But Yale, the No. 14 seed, did more than hang around. In the last minute the Bulldogs reduced the difference to four points three times, and then to only three after Jordan Bruner connected on a 3-pointer with 12 seconds left. But that was Yale’s last gasp. LSU went up by five on two free throws by Skyler Mays with 7.9 seconds to go, and this time Bruner missed from downtown with five seconds left. That was it- an escape by LSU and a tough “we gave it our all” loss for Yale. Yale ended its season at 22-8 while LSU is 27-6 with a least one game remaining against No. 6 seed Maryland, which barely eliminated No. 11 Belmont, 79-77, in the second game of the opening Jacksonville doubleheader. Alex Copeland, who was the MVP in the Ivy Tournament, was the high scorer with 24 points including 3-of-5 triples. He had two of Yale’s three 3-pointers in the last minute. Mays led LSU with 19 points, including 4-of-4 free throws in the final seconds after injuring his finger. Yale had no answer in the paint for 6-foot-11, 250-pound Kayell Bigby-Williams, who blocked four shots in the opening minutes. He had a double-double the most economical way possible, 10 points and 10 rebounds. Together, the much bigger Tigers out-rebounded Yale, 46-38. LSU’s Marlon Taylor held Yale’s Miye Oni (average 17.6 points a game) to five points on 2-of-16 shooting, including 1 of 10 from 3-point range. Oni has been followed by NBA scouts the whole season, although there is a question now if his sub-par performance in this game will have an effect on his value. Benford is in charge of the team since the indefinite suspension of Coach Will Wade two weeks ago for possible recruiting violations. 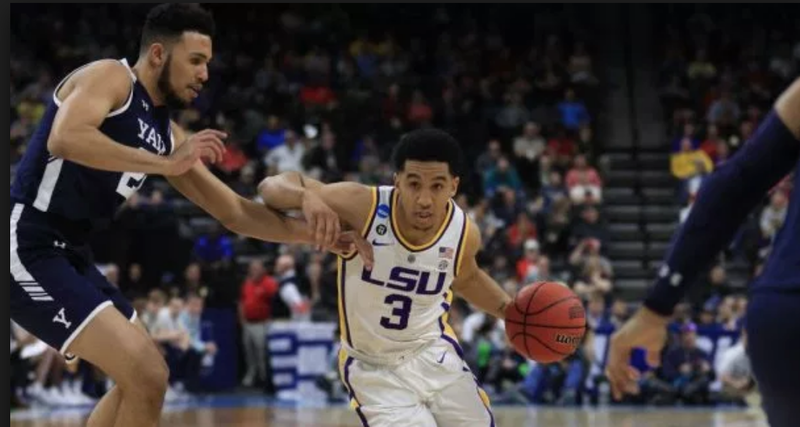 A key performer for LSU was point guard Tremont Waters, who is from Yale’s home city of New Haven CT, and was raised a stone’s throw from the campus. Waters had 15 points, 13 of which came in the first half. He played high school ball in Connecticut at Notre Dame of West Haven and South Kent. During summers he worked out with Bulldog players, attended summer camps run by Coach James Jones, and even was able to use Yale’s gym for weekend workouts and to have his seventh-grade video shot. Not surprisingly, Waters is no stranger to Yale players and Coach Jones. He played on the Connecticut Elite Basketball Club AAU team with Yale’s Azar Swain and in summer pick-ups with Bruner and Trey Phills, among others. But Waters did not go to Yale, although he showed some interest, as did Jones in having him. Nor did Waters go to Georgetown, his original choice before he decommitted. He ended up at Louisiana State University, which is one of the reasons the Tigers are still playing, and the Bulldogs’ season ended in Jacksonville, Fla.